Richard III facial reconstruction based on the skull found under a car park in Leicester has revealed how the English king may have looked. The skeleton found in Leicester has been confirmed as that of the king. 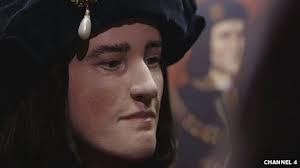 The reconstructed face has a slightly arched nose and prominent chin, similar to features shown in portraits of Richard III painted after his death. Historian and author John Ashdown-Hill said seeing it was “almost like being face to face with a real person”. The development comes after archaeologists from the University of Leicester confirmed the skeleton found last year was the 15th Century king’s, with DNA from the bones having matched that of descendants of the monarch’s family. Richard III was killed in the Battle of Bosworth in 1485, at the age of 32 and after just two years on the throne, having been challenged by the forces of Henry Tudor, the future Henry VII. Richard III Society member Philippa Langley, originator of the search, said on a Channel 4 documentary earlier: “It doesn’t look like the face of a tyrant. I’m sorry but it doesn’t. Layers of muscle and skin were added by computer to a scan of the skull and the result was made into a three-dimensional plastic model. Dr. John Ashdown-Hill said: “I had said previously that when I stood by the grave in Leicester that I felt closer to Richard III than I had ever been, but when I saw the facial reconstruction I realised I had been close to a dead Richard III. The facial reconstruction is particularly important because there are no surviving contemporary portraits of Richard III. The Richard III society will officially unveil the reconstruction at 10:00 GMT on Tuesday, at the Society of Antiquaries in London. It is expected that the reconstruction will be put on public display in future. Experts from the University of Leicester said DNA from the skeleton matches that of a descendant of Richard III’s family. Prof. Caroline Wilkinson said the Dundee team artist, Janice Aitken, used the portraits of Richard III at this stage as reference for hair style and color, eye color, skin color and clothing. “These details are not known from the skeletal remains and are estimated based on the most likely appearance from this period of time,” she said.